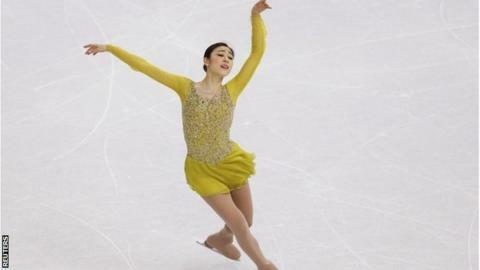 Korea's Yuna Kim is on course to retain her Olympic women's figure skating title after a superb short programme in Sochi. Kim, 23, was awarded a score of 74.92 going into Thursday's medal-deciding free programme, with Russia's Adelina Sotnikova in second with 74.64. Italy's Carolina Kostner, who won world gold in 2012, lies in third with 74.12. Yulia Lipnitskaya, 15, who helped Russia win team gold, fell during her routine and is in fifth. Japan's Mao Asada, who won silver four years ago, is down in 16th after also falling to the ice. British skater Jenna McCorkell, 27, produced a clean routine but finished 25th, with only the top 24 going through to the free programme.